Want to give a gift that is both practical and meaningful? This stunning pendant set makes a wonderful gift for any special occasion or as a simple way to say "I love you." 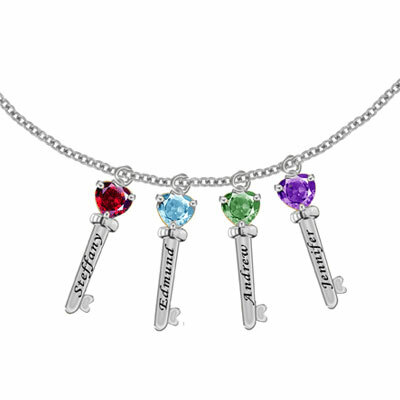 Each of the four charms can be personalized with a birthstone and name to commemorate every member of your family. Enjoy the delicate design of the key pendants and the beautiful engraving of each name. The customized gemstones also add a vibrant splash of color. Discover the difference Apples of Gold's quality and craftsmanship can make and get a personalized ring that will stand the test of time. Make that special someone in your life smile and let them know how much you care. We guarantee our Family Key Pendant Necklace with 4 CZ Stones in Sterling Silver to be high quality, authentic jewelry, as described above.